Saying 'I Love You' in a special way. 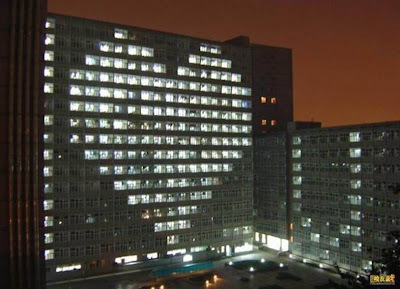 A guy wanted to express his unfathomable love to his sweetheart. So,what did he do........? He gave chocolates to all the girls living in the University student apartments and asked them to turn their lights on or off at 8pm that night. See the picture for the rest............. Truly Breath taking ! You don't need to guess his sweetheart's reaction. The boy has expressed his love very well..
Common give me ur comments ..